What Is Akela's Council? Utah National Parks Council has planned this exciting 3 1/2 day Cub Scout Leader Training for those who have completed the Leader Basic Training. This fast-paced and inspiring training covers den doodles, den yells, relationships, Cub Scout forms, resources, New Adventure Program, skits, puppets, charter renewal, BSA policies, insignia, Webelos Outdoor Experience, Cub Scouts with disabilities and much more. Any Cub Scout Leader from any council is invited to attend. This information for holding a Pinewood Derby was in the 2006 Utah Great Salt Lake Council PowWow book. This is a great idea, and many of the things that were used back then can still be used today. History: The first Pinewood Derby was held in 1953 by Cub Scout Pack 280 of Manhattan Beach, California. Don Murphy was the Cubmaster of that pack and he came up with the concept and rules for the father-son project. He says, “I wanted to devise a wholesome constructive activity that would forge a closer father-son relationship and promote craftsmanship and good sportsmanship through competition.” When the race began, Pack280 had seven dens and totaled 55 Cub Scouts. In October 1954, Boys’ Life publicized the event and offered plans for the track and car, which featured “four wheels, four nails, and three blocks of wood.” Little has changed in the Pinewood Derby car race since 1953. Since that time an estimated 43 million sons and fathers (mostly) have participated. Every year more than a million boys and parents team up to carve, decorate, weigh, adjust, fret over, and finally race a Pinewood Derby Car. Cub Scouts Pinewood Derby Racing has been adopted by the Girl Scouts, Awana Grand Prix, Royal Rangers, Kub Kar Rally, Shape N Race Derby, and most recently WIRL (Woodcar Independent Racing League). 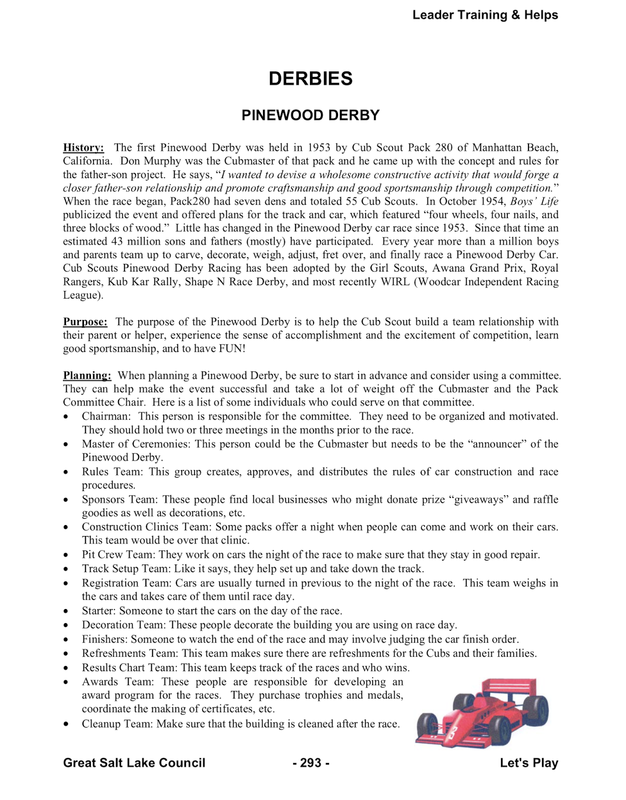 Purpose: The purpose of the Pinewood Derby is to help the Cub Scout build a team relationship with their parent or helper, experience the sense of accomplishment and the excitement of competition, learn good sportsmanship, and to have FUN! Planning: When planning a Pinewood Derby, be sure to start in advance and consider using a committee. They can help make the event successful and take a lot of weight off the Cubmaster and the Pack Committee Chair. Here is a list of some individuals who could serve on that committee. Chairman: This person is responsible for the committee. They need to be organized and motivated. They should hold two or three meetings in the months prior to the race. goodies as well as decorations, etc. Construction Clinics Team: Some packs offer a night when people can come and work on their cars. This team would be over that clinic. Pit Crew Team: They work on cars the night of the race to make sure that they stay in good repair. Track Setup Team: Like it says, they help set up and take down the track. the cars and takes care of them until race day. Starter: Someone to start the cars on the day of the race. Decoration Team: These people decorate the building you are using on race day. Finishers: Someone to watch the end of the race and may involve judging the car finish order. Refreshments Team: This team makes sure there are refreshments for the Cubs and their families. Results Chart Team: This team keeps track of the races and who wins. coordinate the making of certificates, etc. Cleanup Team: Make sure that the building is cleaned after the race. Cub Scout Monthly Themes 2019 and Beyond and Pack Meeting plans for every month's themes! !